I was given seeds of an heirloom vegetable that had a hand written description of "C pepo Kaempw Melon Rilon". I don't know how to pronounce it. The a and e were joined together, and it looked like there was a dot or two above them, I don't know if that changes how it is pronounced. From the word 'Melon' I assumed it was a pumpkin of some kind rather than a zucchini or a squash, as there are several different C pepo pumpkins, but other than that I did not know what to expect. Once the leaves started to grow, and the flowers appeared, I had a look and am almost certain that it is C maxima. These were large sized pumpkin seeds, they took 10 days to germinate and the cotyledons were huge! The plants then started to grow true leaves and the plants began to turn into regular looking pumpkin vines. Then something happened. At each node where the plants were growing a leaf they started to sprout roots. I have grown many different varieties of pumpkin over the years, but for some reason I have never looked closely at a pumpkin plant before. I normally put them in, water them while thinking of other things, and then frost kills the plant and I harvest the fruit to store somewhere until we are ready to eat it. 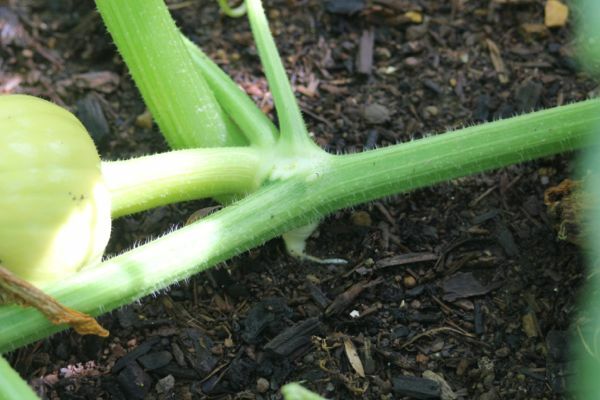 As I normally do not look too closely at the pumpkin vines I do not know how common this trait is. After looking on the internet it appears that it is more common in C maxima than in the other cucurbit species. It is a very useful trait to have. 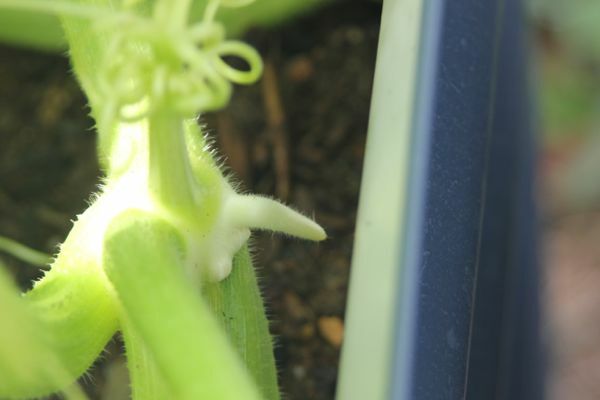 This trait of the pumpkin plant rooting at each node is fantastic. It means that each plant is far stronger, more resilient and potentially more productive than it otherwise would have been. 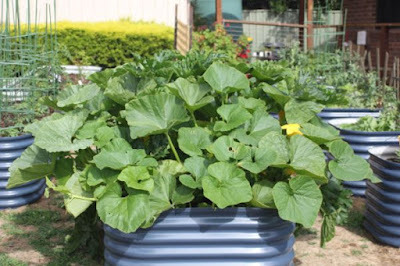 Pumpkin leaves normally wilt away to nothing on hot days, only to return after watered in the evening. Rooting at each node meant that it stands up the the heat slightly better than it other wise would. They still can not be used as an effective ground cover as when it gets hot they still wilt to nothing, but the leaves are big for another hour each morning which slightly reduces the amount of moisture lost through evaporation. Growing roots at each node also means that I can easily take a rooted cutting and plant it somewhere else in the garden to expand my crop. Each vine produced several rounds of pumpkins. The first round of pumpkins weighed about 8 kg each, if they weren't picked the second round weighted about 5 kg each, and the third and subsequent rounds weighed about 3 kg each. Normally I don't pick pumpkins until after frost has killed off the vines, but if I picked the pumpkins when they looked about ripe each subsequent round of fruit was much closer in weight to the first round. As this variety kept producing more lots of pumpkins I pick them when they look ripe instead of waiting until frost kills the vine. Kaempw Melon Rilon pumpkins are great to eat! Normally the skin on larger fruiting pumpkins can be thick and difficult to cut through. The skin on these pumpkins is remarkably thin, making it very simple to cut up and also probably limiting its storage ability. I haven't tried to store them yet as we eat them pretty fast. These Kaempw Melon Rilon pumpkins also taste pretty amazing. The flesh is orange and sweet, this is either my favourite or second favourite tasting pumpkin variety. Considering how many varieties of pumpkin I have tasted over the years this is a rather impressive claim. The flesh seems to fall apart easily if cooked in the right way, making these pumpkins simple to turn into pumpkin soup or pumpkin scones or pumpkin slice (which is absolutely delicious) or many meals where we want to include pumpkin but not have the kids notice large pieces of pumpkin. This pumpkin also roasts rather well making delicious roast pumpkin. We tried to make pumpkin lasagne using them instead of pasta, and they did not work all that well for this as they were a bit soft. We also tried to make pumpkin chips, again this is not the greatest variety for that purpose, again they were a bit soft and fell apart a bit too much. 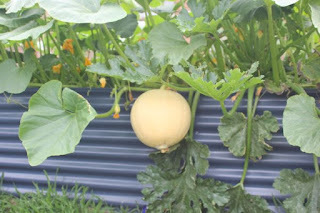 At first when I saw the size of the large pumpkins I decided not to grow this variety again. I figured we could not get through pumpkins that large and would end up wasting some of it. After tasting them I wanted to find a way to make it work, but still thought we probably would not get through them as not only are the pumpkins large, but each vine produced multiple fruits. I also recorded the pumpkin days to maturity, considering how large the pumpkins are they ripen remarkably fast. So far we have not wasted any pumpkin at all, in fact I wish we had more of them. We only have three left as we have been eating them so fast. Now that we have used them in several different types of meals, and seen how productive, tasty, and versatile they are I am pretty sure that I will grow them again. I don't know if anyone else in Australia has Kaempw Melon Rilon pumpkins, but I wish they did. If anything happens to my stock I have no way of getting them back again. More seed savers are needed for this amazing heirloom pumpkin. Even though I don't know how to pronounce it, and can't spell it without looking it up, I am also taking care not to change the name. It was called Kaempw Melon Rilon when I got it and it will keep its name. If someone can translate this to English for me I may consider using its English name. Until then, it has a fun and unpronounceable swedish name. 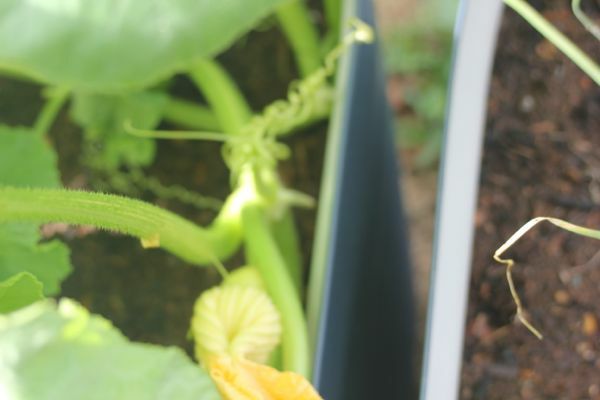 I have taken great care to save pure seed from these pumpkins and will offer it on my for sale page along with the other heirloom vegetable seeds and perennial vegetables that I have for sale.